My husband told me that I needed to post more about our everyday life. So today is just an ordinary Tuesday and I just put dinner in the oven. Tonight because I need to go to the grocery store, I am just using what I have on hand. 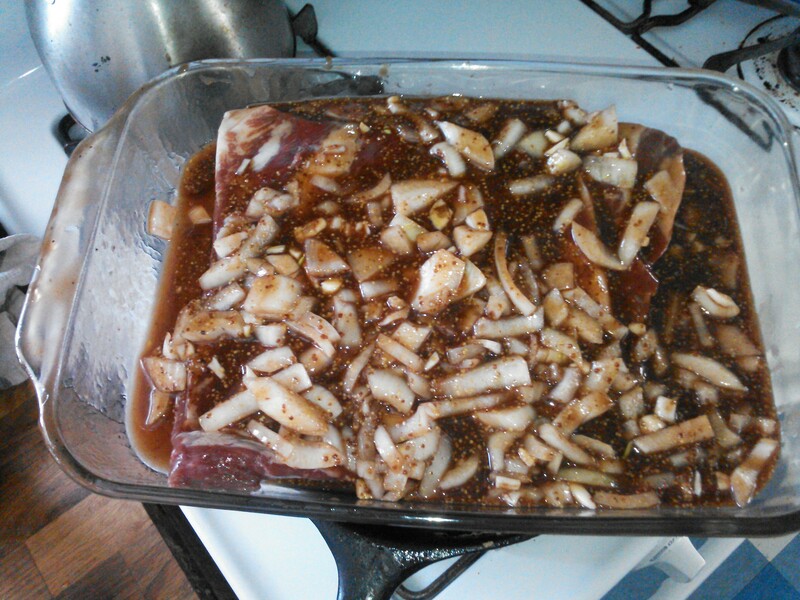 Tonight it is beef brisket. Yes, I have beef brisket on hand. We order 1/2 side of beef a year, every March. Ok stepping on my SOAP BOX: To make good meals, you need to start with good food. We grow our own or buy local as much as possible. The beef that we buy, we know the name of the farm, we know the name of the farmer, the vet that takes care of the cows, the name of the cow, heck I know the name of the cow’s mother! I know where my beef comes from, that is so important. It is really important to our family because there was this incident when stores where spraying their ground beef with red dye to make it look fresher, my husband is allergic to red dye. I know 100% for a fact that there is no red dye in my beef! Plus, I get a better price per pound than the store, plus, plus, I am helping small local farmers. It is a win, win, win all around.This is the farm we choose to support, Family A’Fair Farm like them on Facebook to follow what they are up to. OK stepping off soap box. This time of year, I always seem to have the higher end cuts left at the end of our “beef year”. I think that I am going to use them for Birthdays or Anniversaries, but I never do. So here it is the end of February and I am almost out of ground beef and chicken. So we are having beef brisket on a Tuesday! Let’s get cooking. If I was organized and planned my life out perfectly, I would have taken this brisket out of the freezer yesterday. I know I am committing culinary sin by not marinating my meat, but I function in the real world and I honestly am proud of myself for thinking about dinner before 4:30. Also, like I said, I need to go shopping and we are at the end of a “storage” season. I am out of my canned tomato sauce, I am out of chicken, out of ground beef, running low on onions, BBQ sauce, stock… the list just goes on. I am so ready for spring and the food abundance that it brings. 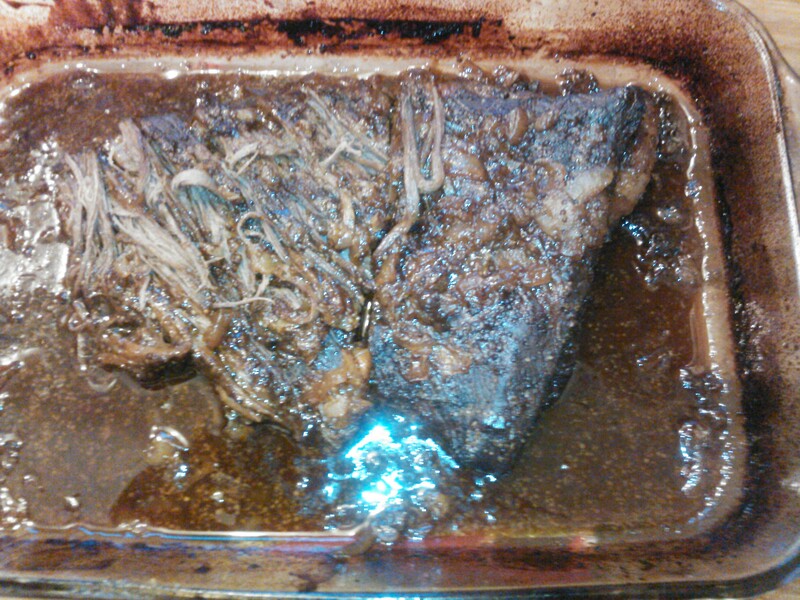 Anyway, I threw together this brisket with what I had in the fridge, so pardon my unclear measurements. My last minute marinade, is the last of the BBQ sauce that I have in the fridge, plus some water to make sure I cleaned out every drop of sauce. 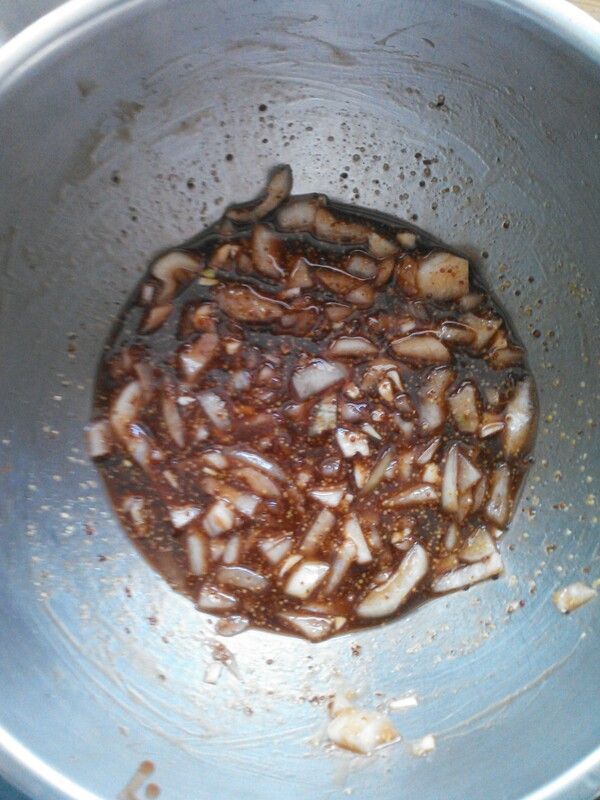 1/2 a cut up onion, 1/4 cup brown sugar, 2 tbsp balsamic vinegar, 2 tbsp mustard, 2 tbsp soy sauce, 3 cloves of garlic (various sizes, about 1/2 tbsp garlic), 4 tbsp blush wine, plus some for myself, and yes it is after noon somewhere. I also added cracked pepper and some paprika, I have no idea how much, just till it looked right. I stirred all this together and poured it over my half frozen, un-marinated brisket in a 8×11 baking dish and covered with tin foil. I threw the whole thing in the oven on 275. The high temp today outside is suppose to be 10 degrees, so I was OK with running the stove for a couple of hours. If I did not want the stove on, I would have put this in the crock pot this morning. 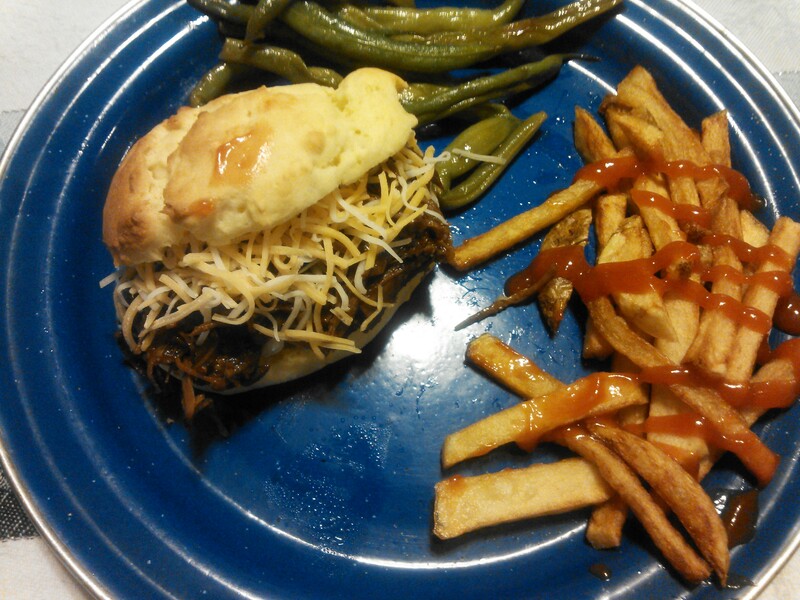 I am going to serve this brisket with gluten free no yeast rolls that I making from scratch, hand cut french fries and whatever green vegetable I can find in the freezer. I think it will be green beans, again my stock is running low! I tried to add a recipe card, but I am having software problems. I will update final pictures of the meal and a recipe card later this evening.